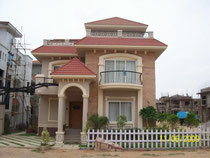 4 BHK VILLAS. EAST FACING VILLAS\ FOR SALE. AREA--333 SQ Y.BUILT UP AREA--3600 SFT. RATE--1.50 CR. ONE WEST FACING VILLA IS ALSO FOR SALE. It is on banglore highway nh-7. Satam rai village 1km after elevated express way.